We now stock a range of ear stretching kits in surgical steel or acrylic. These kits normally allow the holes in stretched ears to be expanded in 1 or 2mm increments. 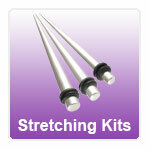 Our stretching kits are available as steel insertion pins or straight/curved tapers.